I’m not a cat person, so I could never get excited about the creepy cat cafes that have popped up around the world. While I can’t say I really consider myself a rabbit person either, the idea of a “Bunny Spa” is much more intriguing. 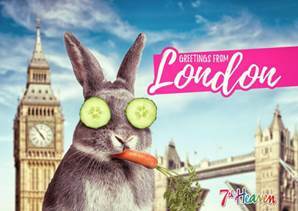 This month, British beauty brand 7th Heaven – not to be confused with the American TV show from the 90s – is launching an epic PR stunt that has me wishing I could hop the pond (pun intended) to London for a little pampering, complete with furry friends. From March 12-14, 7th Heaven is giving away 1,000 “Golden Tickets” to their Covent Garden pop up with their “Bunny Therapists,” where rabbit and spa-fanatics alike will receive free facials and massages. Yes, you read that right, your spa service — complete with roaming bunnies rescued from the Greenwich Rabbit Rescue (who knew rabbits had their own shelter?) — will be completely complimentary. By hosting this pop up, the cruelty-free beauty brand will be pampering both humans as well as homeless bunnies, which can be adopted should you happen to fall in love halfway through your facial. Hopefully 7th Heaven will make its way stateside, because if anything can make me become a rabbit person, it’s free spa services.